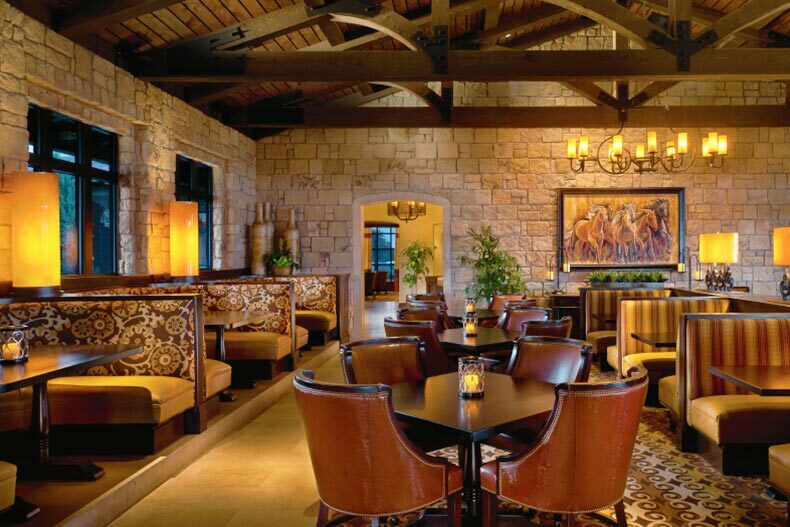 The Robson Ranch Wildhorse Grill is a full-service restaurant, lounge, and sports bar. When active adults reside in a 55+ community with an onsite restaurant, going out to eat is deliciously simple. If active adults dine out with friends, they can indulge in laughter and conversation. If they go out to eat solo, they can catch up on a good book or engage in some people watching. It’s easy to stroll to a neighbor’s home and walk together to the restaurant. Studies show that dining in the company of at least one other person can lower feelings of loneliness and encourage healthier eating habits. Active adult homebuyers who desire to live in a Dallas-area community with a restaurant will relish these outstanding neighborhoods. At Robson Ranch in Denton, homeowners can head to the Robson Ranch Wildhorse Grill, a full-service restaurant, lounge, and sports bar that serves many Texas favorites. Active adults can savor an intimate dinner or gather with friends on the covered patio to enjoy sweeping views of the golf course over a casual lunch. Upon completion, Robson Ranch will be home to 7,200 homes, making it one of the largest active adult communities in Texas. Residents at Heritage Ranch in Fairview are just a stroll away from a good meal at The Corral Grill Restaurant and Lounge. Active adults can enjoy Sunday brunch, formal dining, buffets, and prime rib specials, or take a meal to-go at The Corral Grill. This 55+ community in Fairview also contains the Outpost Grill for more laid-back gatherings and neighborhood socials. Heritage Ranch contains 1,144 single-family homes and attached villas offered in 21 different floor plans. Situated within The Tribute master-planned community, homeowners at Waterford Point at The Tribute can enjoy the many amenities of The Tribute, including several restaurants and pubs. Residents can also take advantage of a fitness center, aerobics studio, and private massage rooms. A lakefront fire pit is a perfect spot to relax with friends and soak in the beauty of Lake Lewisville. Upon completion, this age-restricted community will contain 417 single-family homes in four separate model collections. A farm-to-table café is just one of the many desirable amenities awaiting active adult homebuyers at Sweetwater at Light Farms. This new active lifestyle community within the Light Farms master-planned community in Celina offers a clubhouse with a fitness center, outdoor pool and patio, fire pit, dog park, and sports courts. Active adults can take a brisk morning jog around the neighborhood’s miles of trails or invite neighbors to a friendly game of volleyball, tennis, or bocce ball. Residents at The Village at Prestonwood can enjoy all the finest amenities along with an onsite bistro. This gated 55+ community in Plano is next door to The Premier Club, where active adults can satiate their hunger with a meal at the bistro, work out at the fitness center, or take a dip in the indoor pool and spa. Active adult homebuyers who desire a carefree way of life will delight in this community, which contains 128 low-maintenance homes. At Watermere at Southlake, an active lifestyle community in Southlake, residents can have dining experiences at restaurants that rival a five-star resort. This luxurious community is home to La Mer Restaurant, which serves modern cuisine in an elegant setting, River Bend Café, where homeowners can stop by for a light bite, and Stone Ridge Lounge, a full-service bar with regular happy hours. Built in 2007, Watermere at Southlake contains 106 attached and custom cottages that range in size from 2,127 to nearly 4,000 square feet.